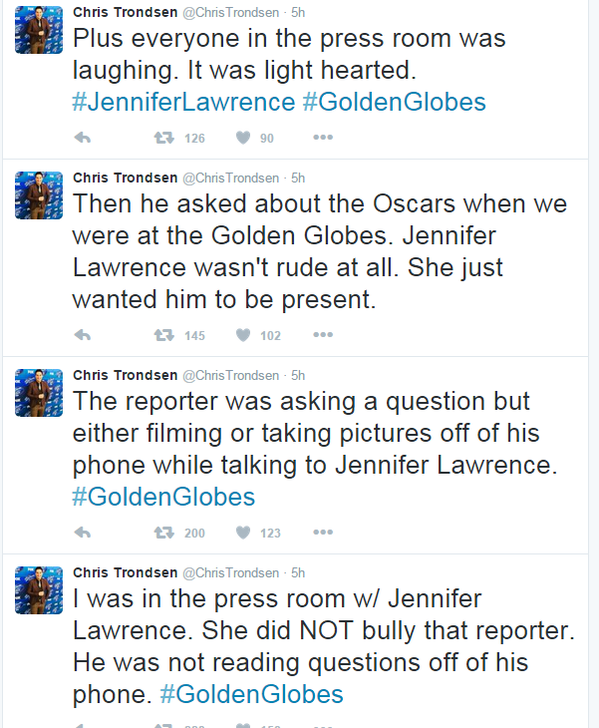 I was surprised and annoyed that what I considered a minor incident at the Golden Globes press conference with Jennifer Lawrence should become an issue in the Twitter-verse. To most of you, I say: You had to be there. Context is everything. To begin with, backstage is filled with journalists who have been sitting all day waiting for the award winners to come backstage. This is a group of high level of professional journalists. Many speak more than one language and are assigned here specifically because of their English abilities. When a winner is brought back, the winner is announced and walks up on a small stage to stand behind a mic and the reporters raise their hands to ask questions. We understand that there is little time and with the bigger awards and bigger stars, more questions than there is time for. Things need to go fast, but there is an etiquette involved. There are two microphones on either side of the room. When you get one in front of you, you need to look up from your laptop or stop taking photographs. You might want to steady the microphone while you ask the question and you should look at the winner because part of communication is body language and facial expression. I was on the other side of the room from the reporter who was chastised, but I was sitting in between two foreign correspondents, both of whom spoke Chinese, but spoke English to me. One of those reporters was able to ask a question during our time backstage. When Jennifer Lawrence came backstage, she did not make a general statement, but was immediately asked the first question, which she replied to before the actual question was out. Lawrence responded, “We are at the Golden Globes. If you put your phone down, you would know that.” There was laughter from other journalists. What I recall about the incident in question is that the reporter was holding his cellphone in front of his face. The reporters on either side of me, were also using their cellphones to take photos and tweet, but the person on my left did not do so when she got the mic and was asking a question of another winner. In the beginning, Lawrence set the tone and the pace by answering the question that wasn’t asked. You can choose to be insulted or you can choose to be part of the party and wonder how you’d field the extra body part question. I would choose Peeta.